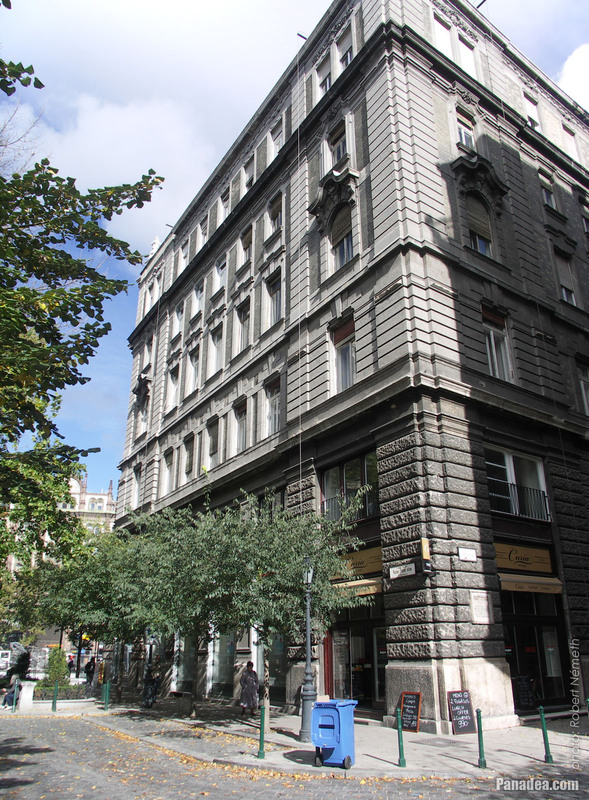 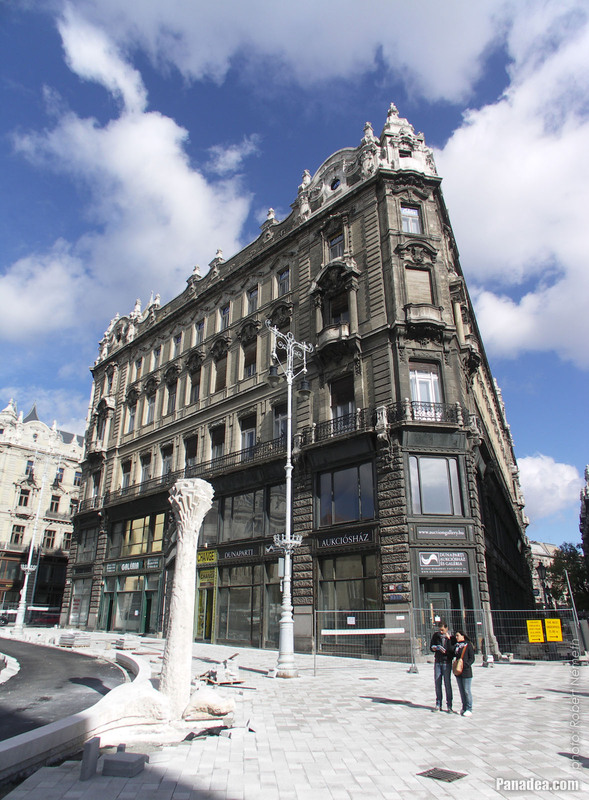 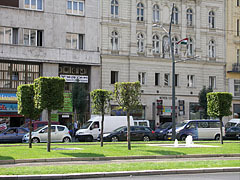 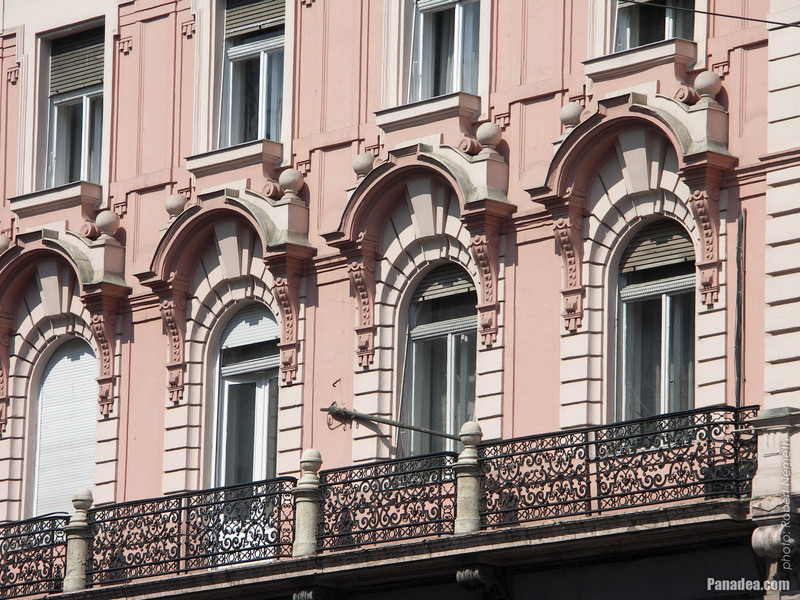 The so-called Piarist Block building complex was designed by Dezső Hültl, built between 1914-1917, and the last renovation was completed in 2011. 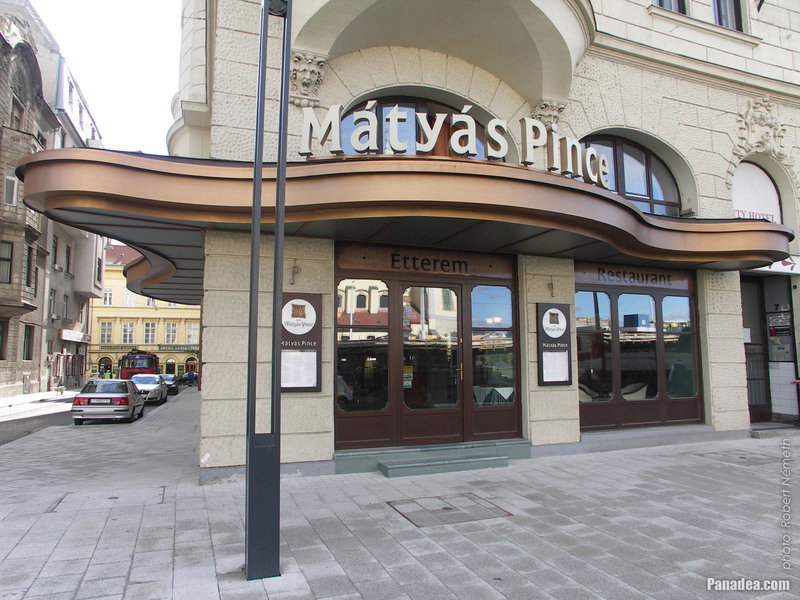 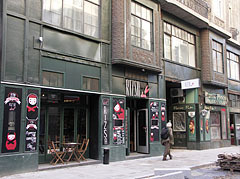 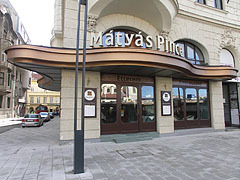 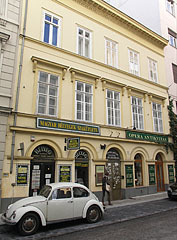 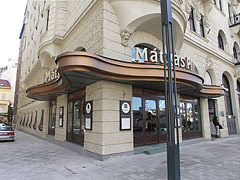 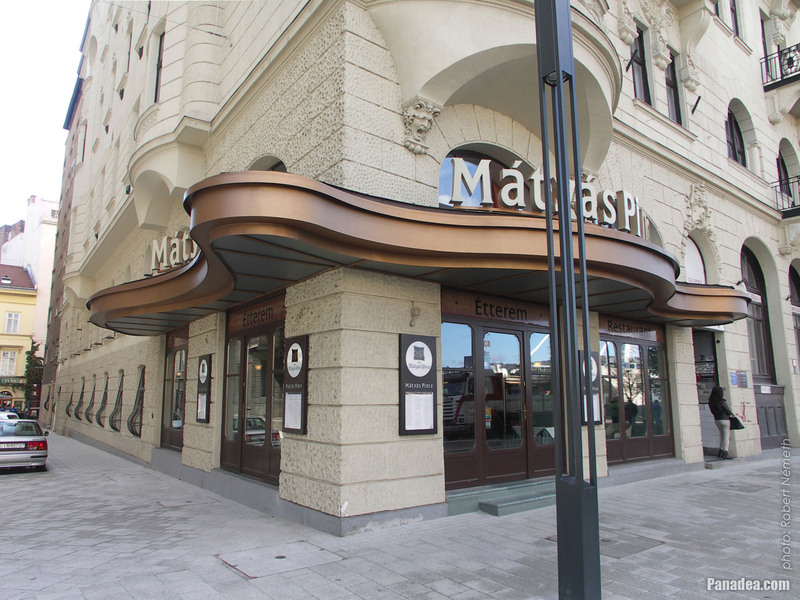 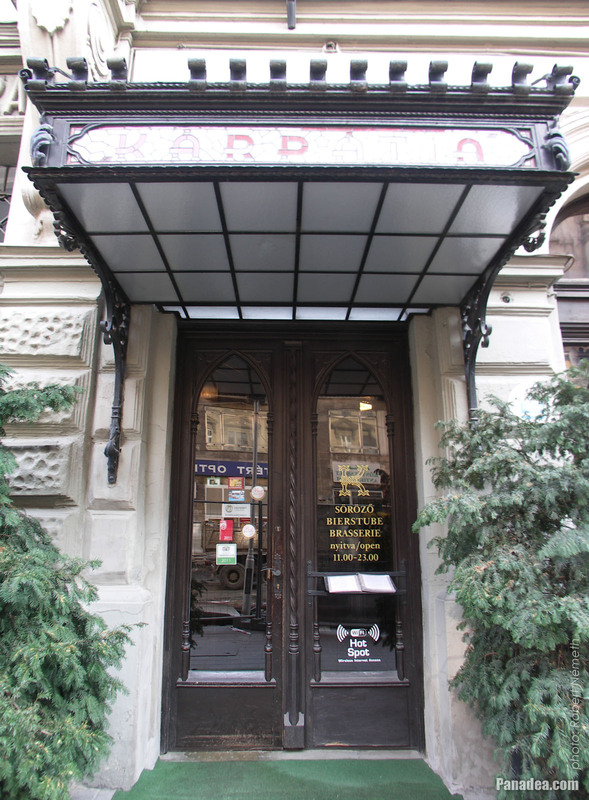 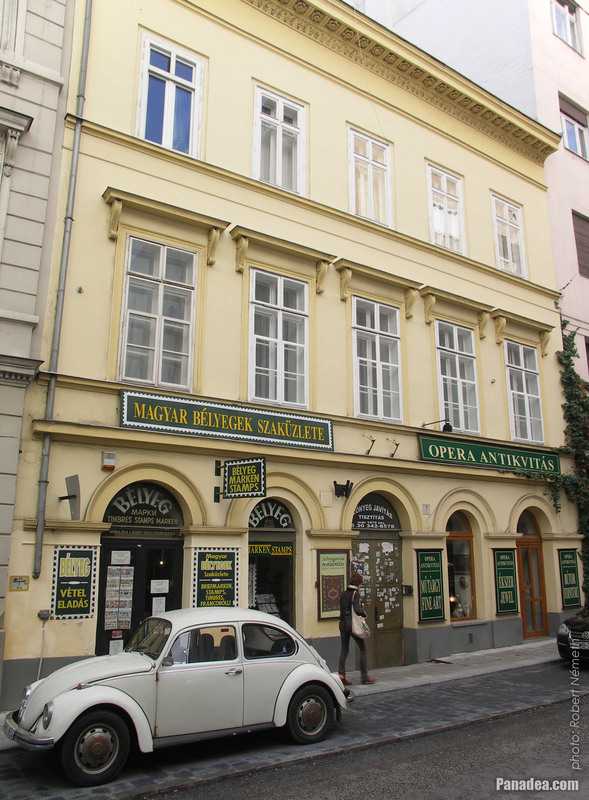 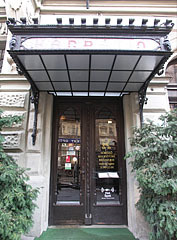 The brasserie received its name after its founder Mátyás Baldauf of Borostyánkő. 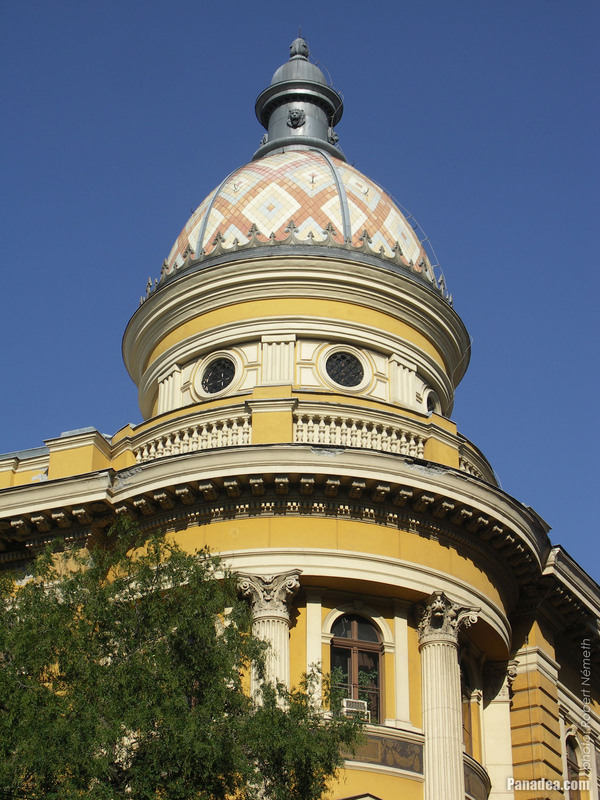 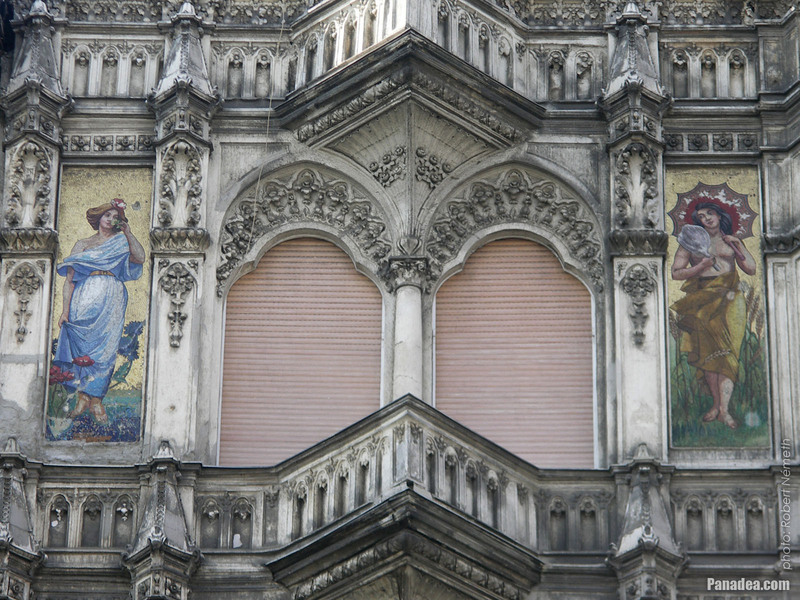 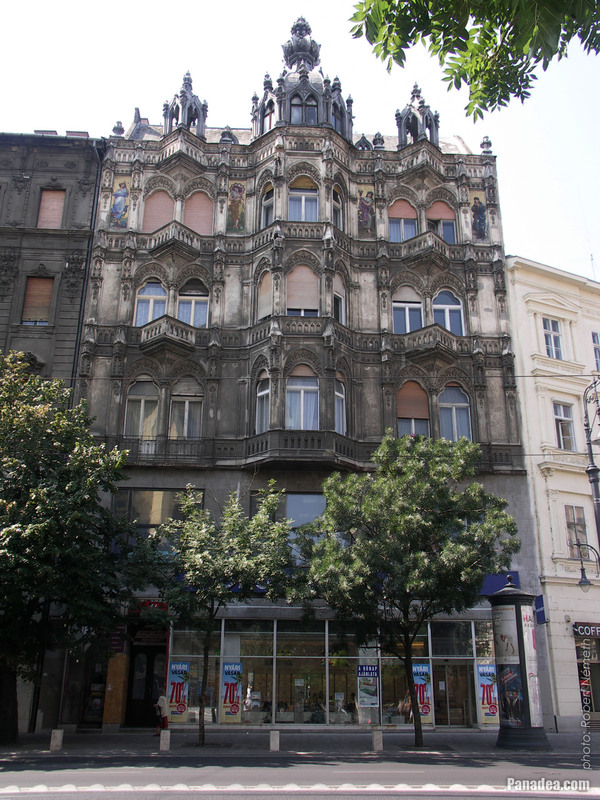 It was built between 1873-1876 by the plans of the Hungarian architects Antal Szkalnitzky and Henrik Koch junior, the sgraffito pictures on the facade were created by Mór Than Hungarian painter. 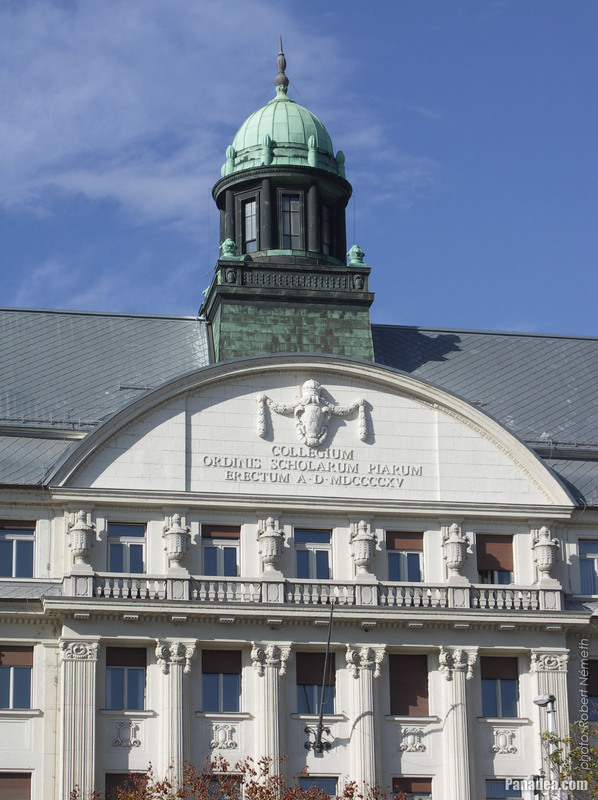 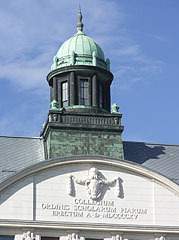 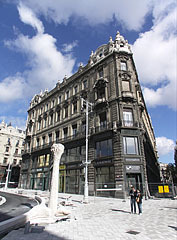 It was built in 1894, designed by Sándor Hauszmann, Flóris Korb and Kálmán Giergl. 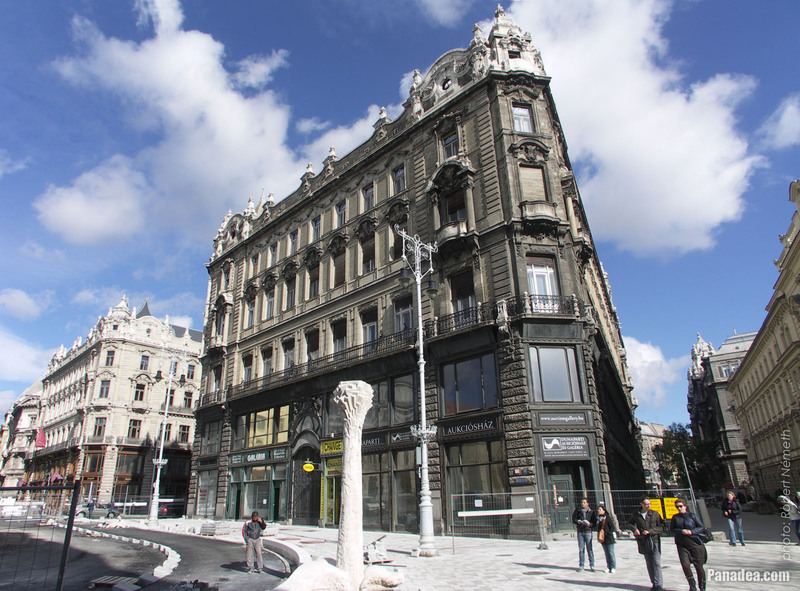 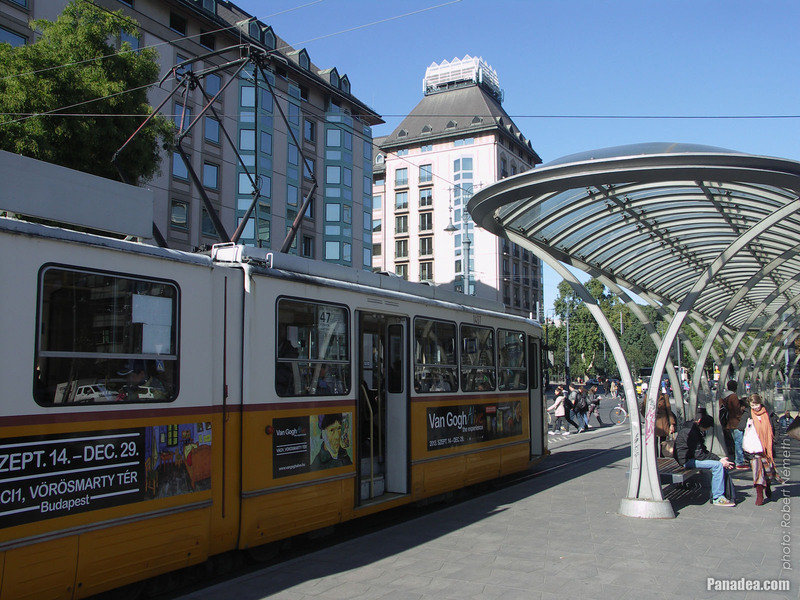 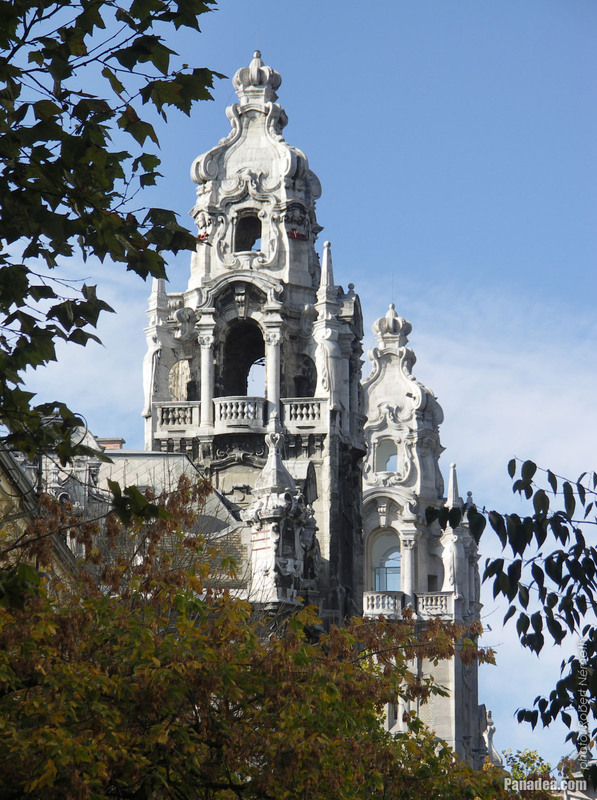 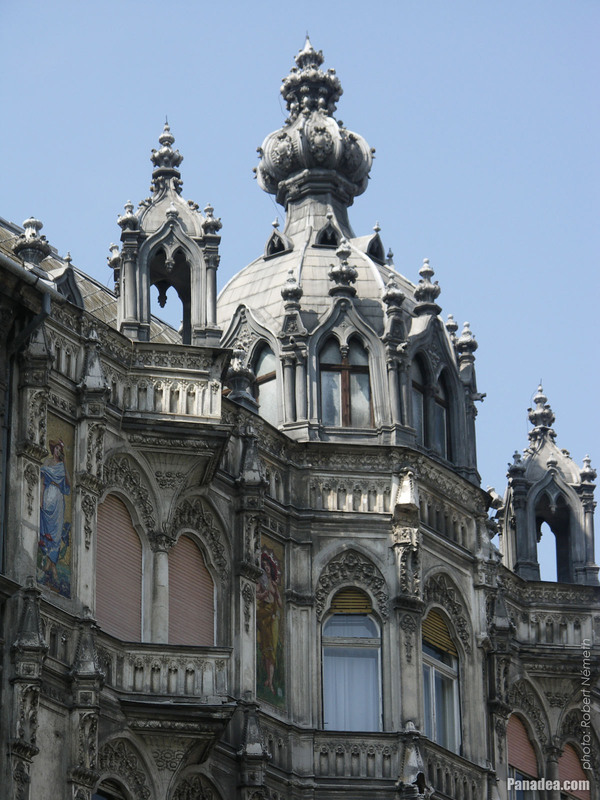 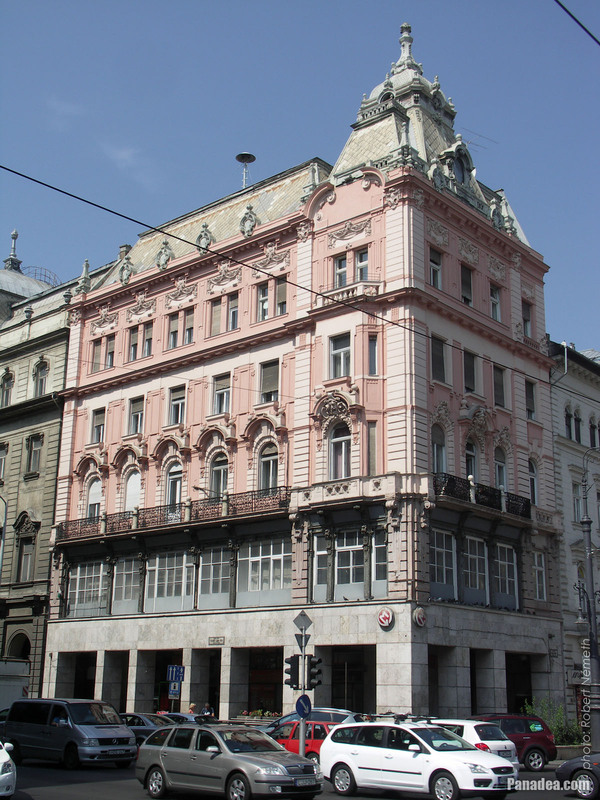 It was designed by Ernő Schannen and built in 1896. 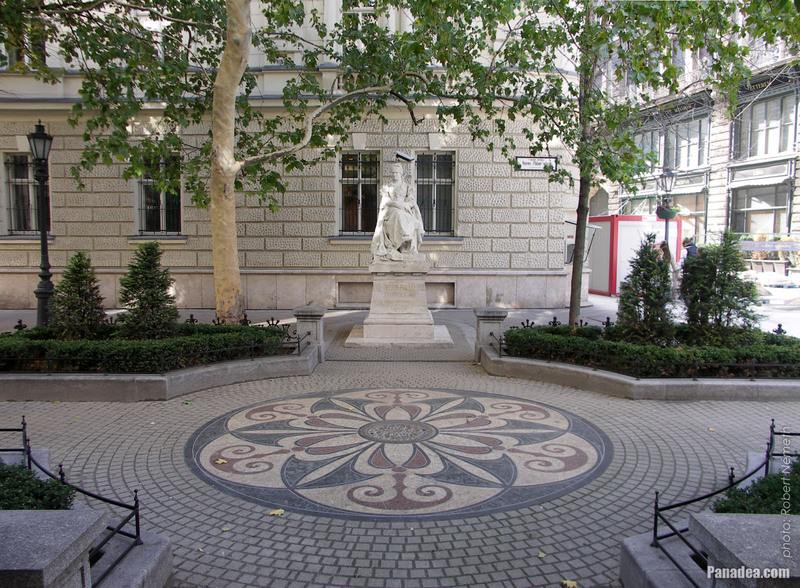 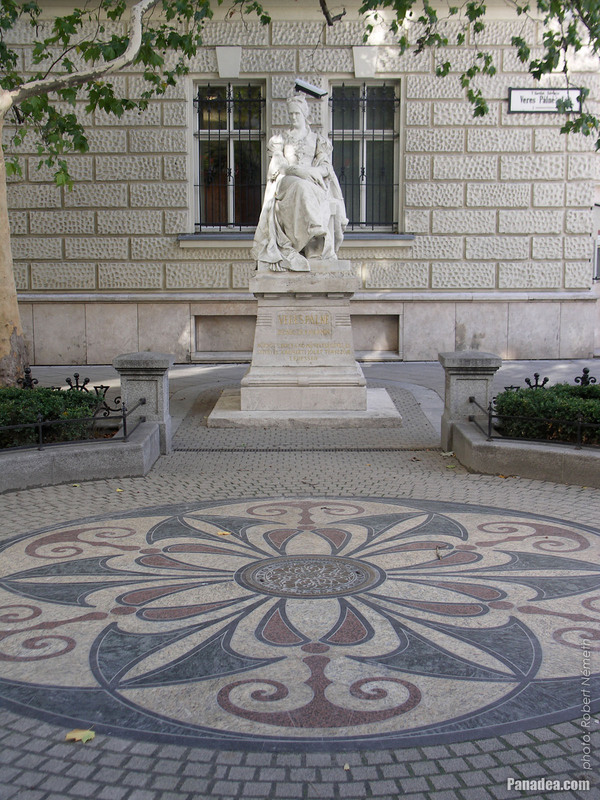 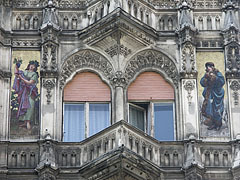 On the top of the facade the "Four seasons" mosaic decoration is created by Miksa Róth. 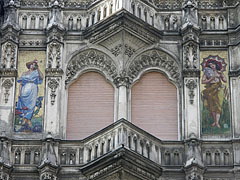 The picture shows the female figures of the spring and the summer from the four seasons. 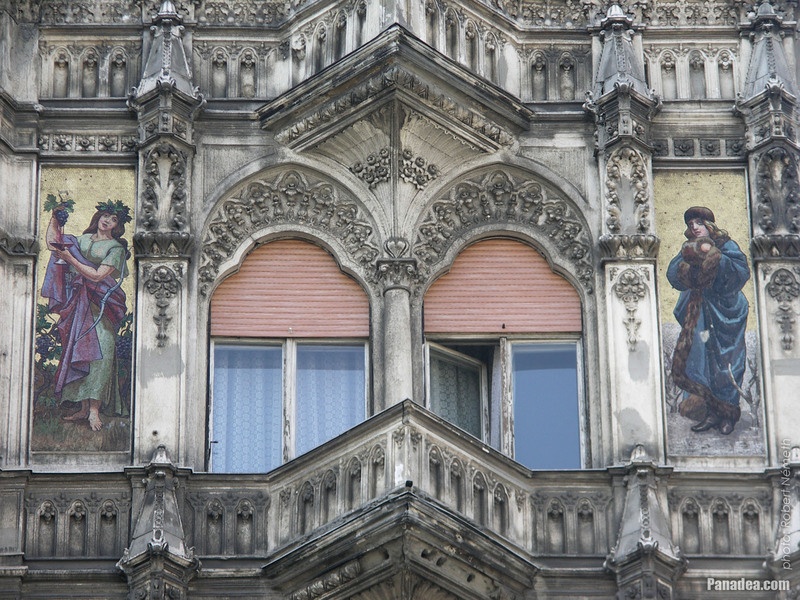 From the four seasons the female figures of the autumn and the winter can be seen on this picture. 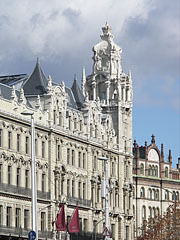 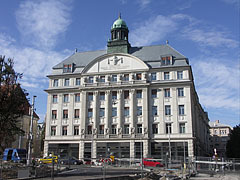 The Röser Bazaar building was built between 1882-1884, designed by József Kauser. 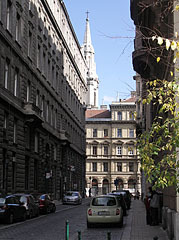 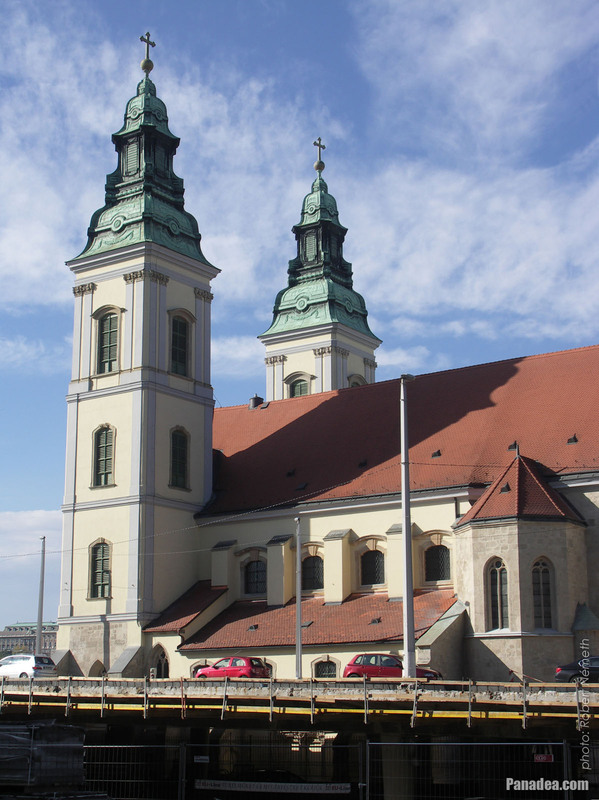 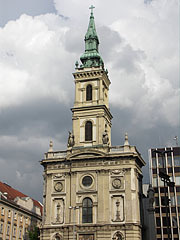 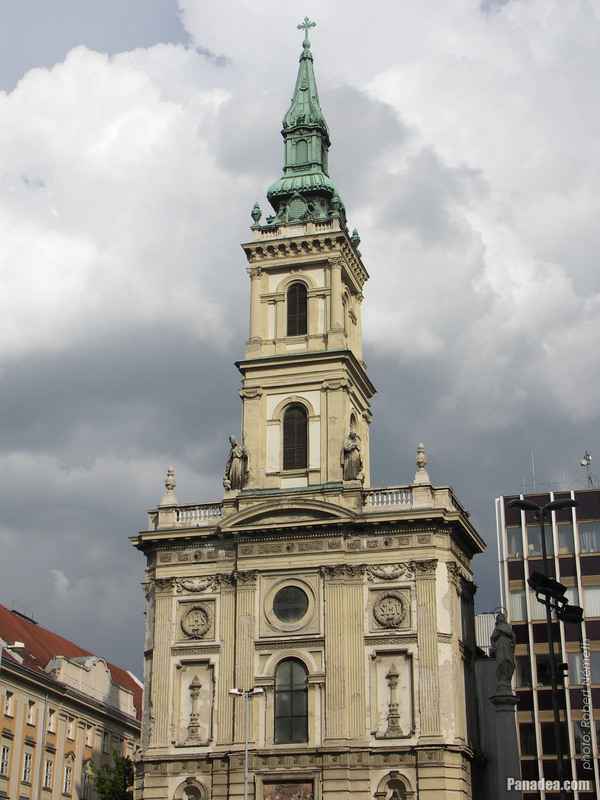 The church was built between 1725-1732, designed by János Hölbling and János György Pauer. 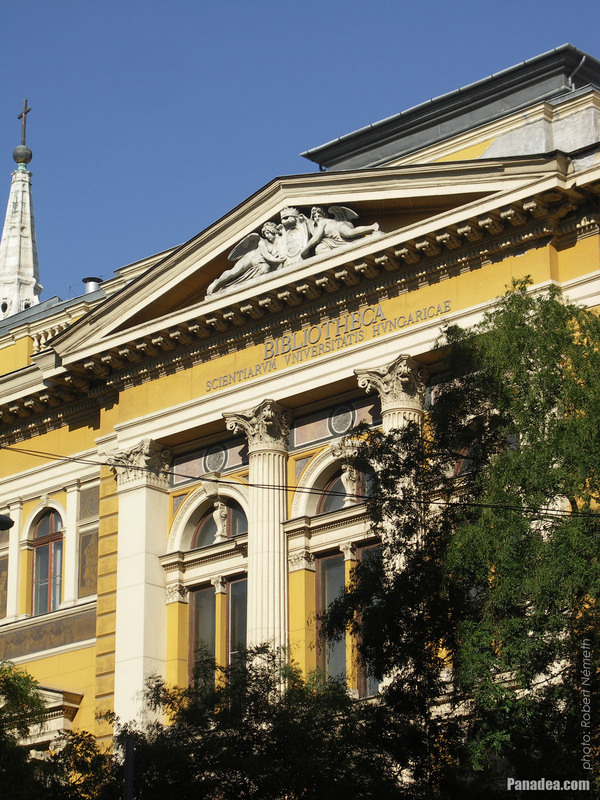 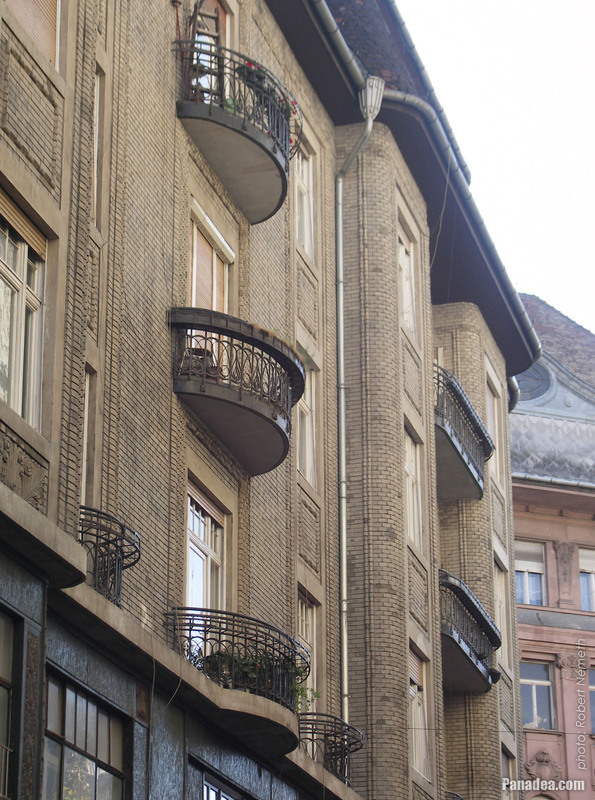 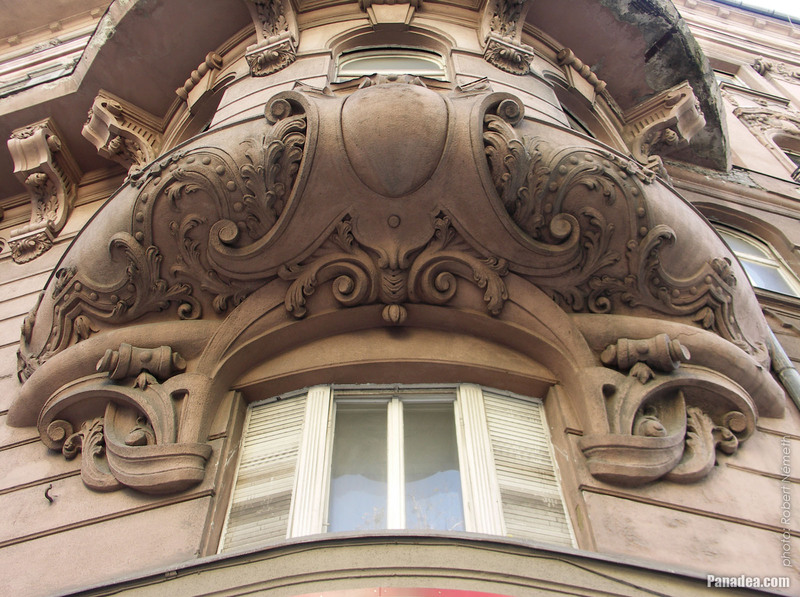 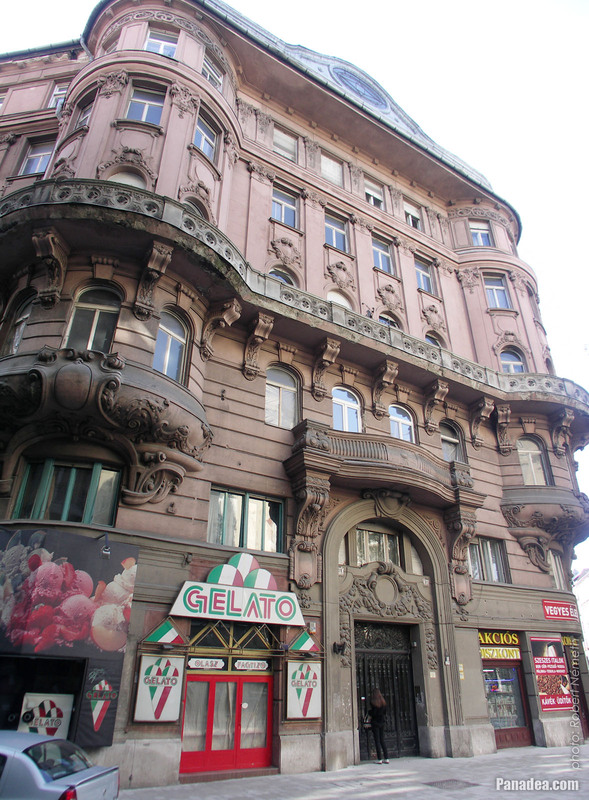 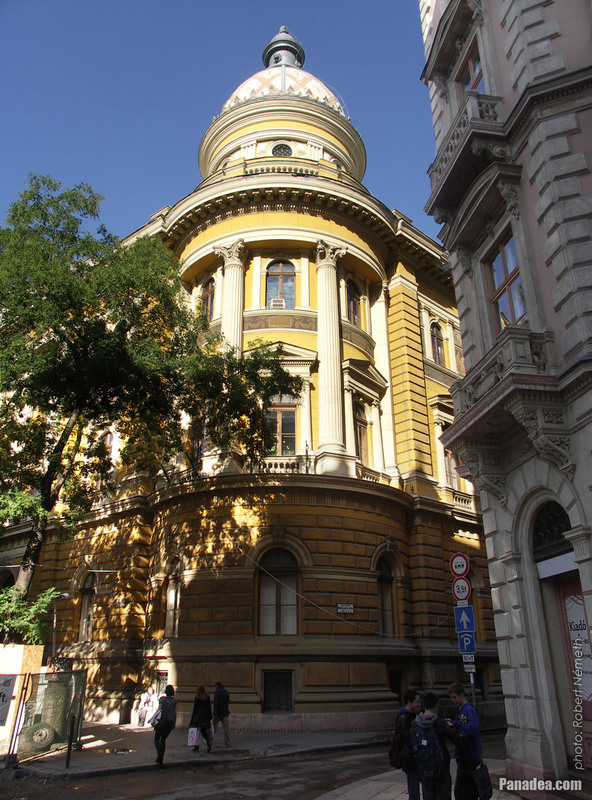 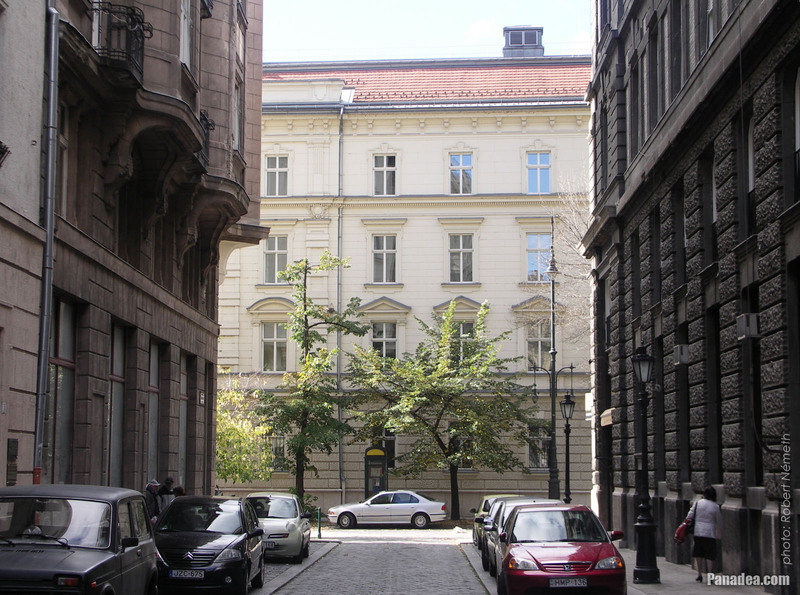 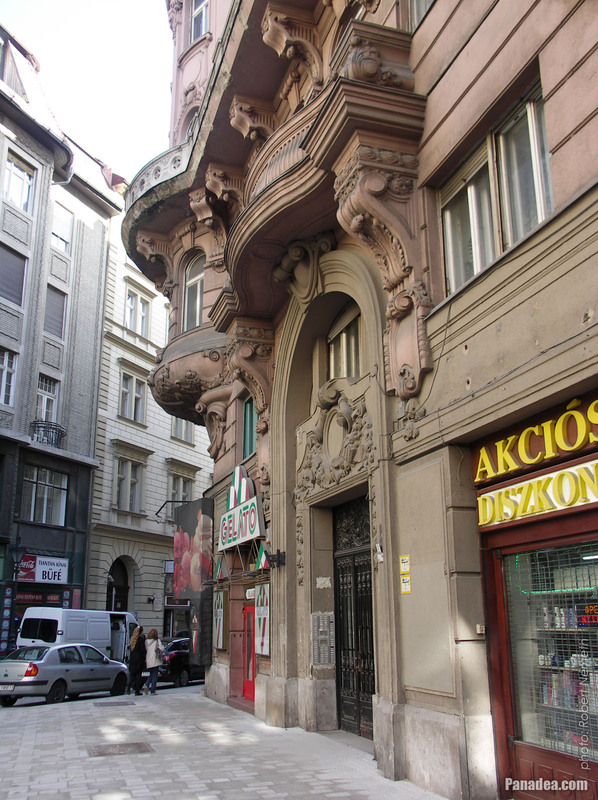 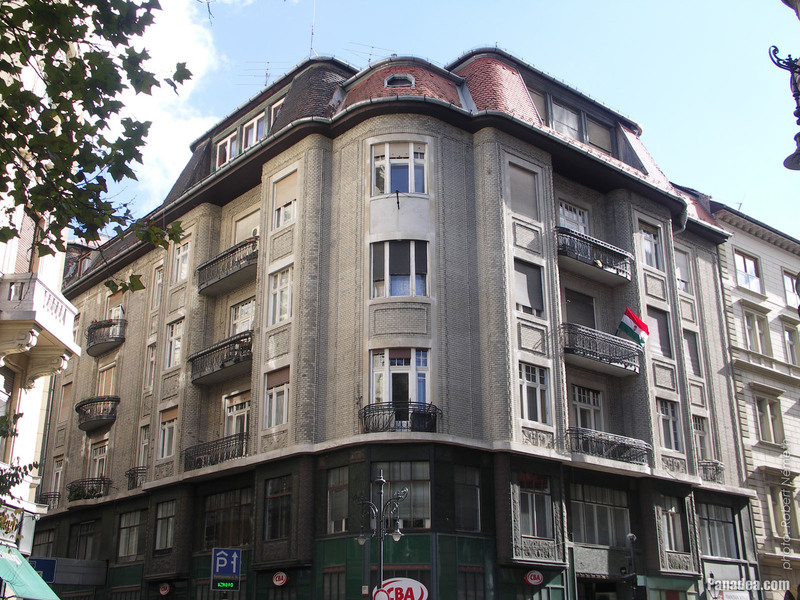 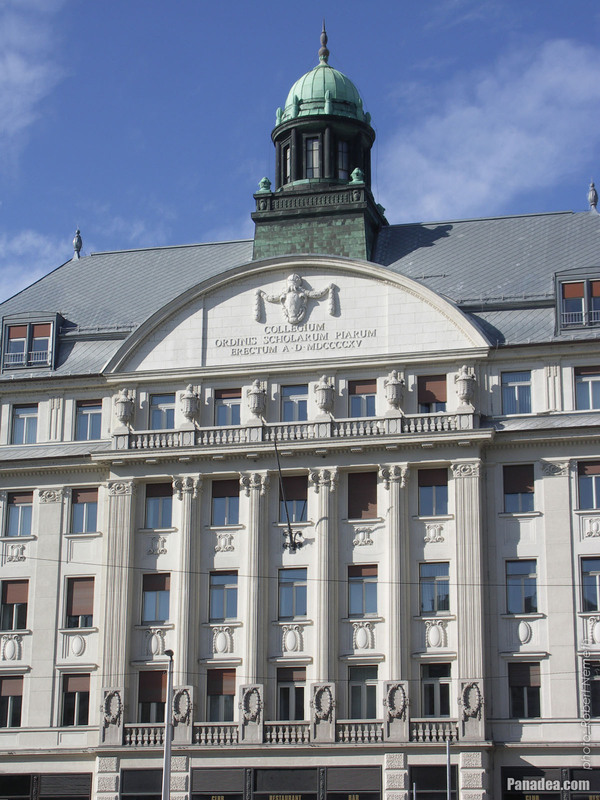 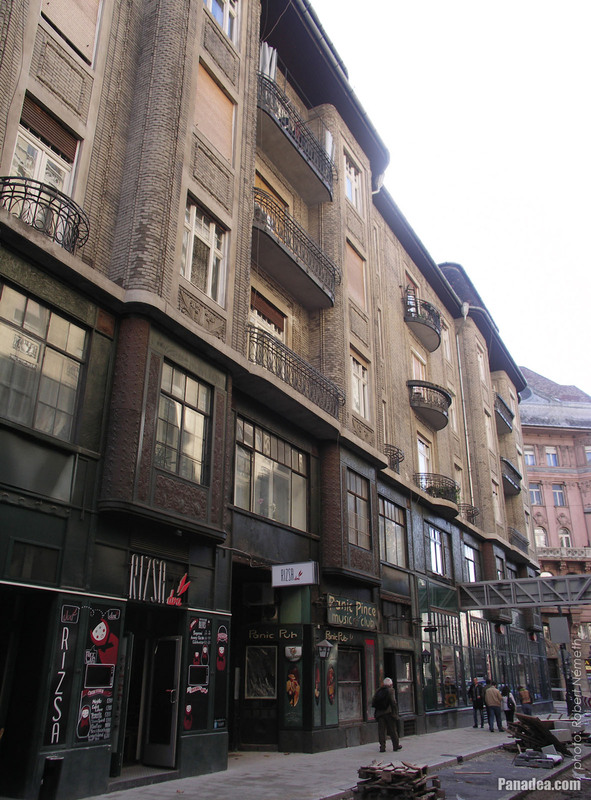 The current Art Nouveau (secession) style building was designed by József Kollár and Sámuel Révész (Rosenfeld), built in 1914 by extending the so-called Barabás House (which was built in 1903, architect: Rezső Schütz). 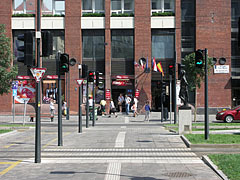 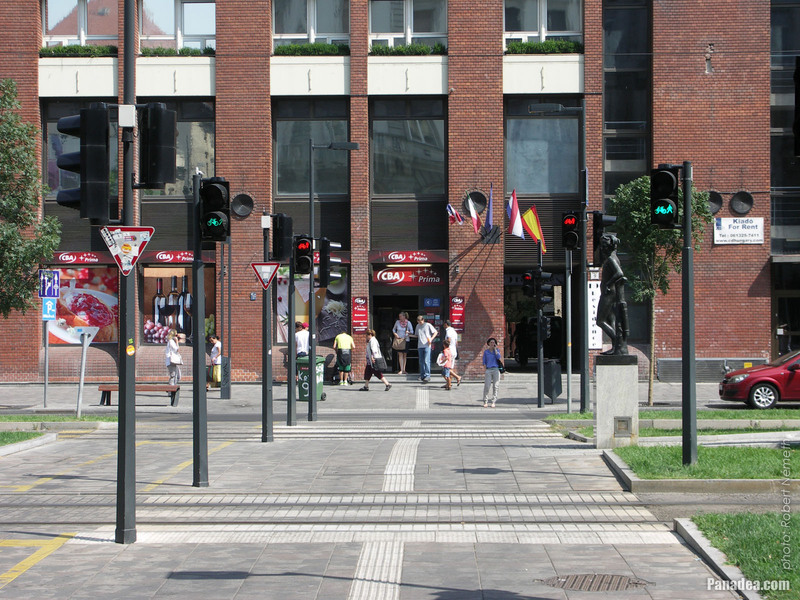 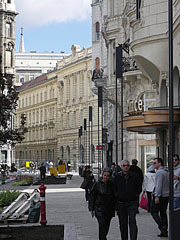 Around the buildings the streets are undergoing renovations. 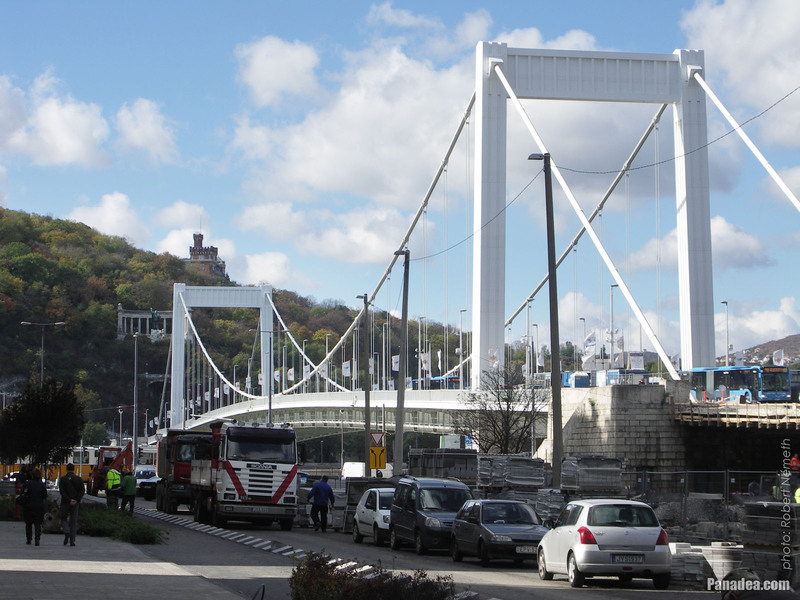 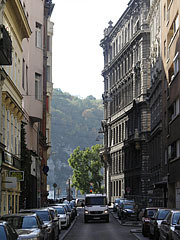 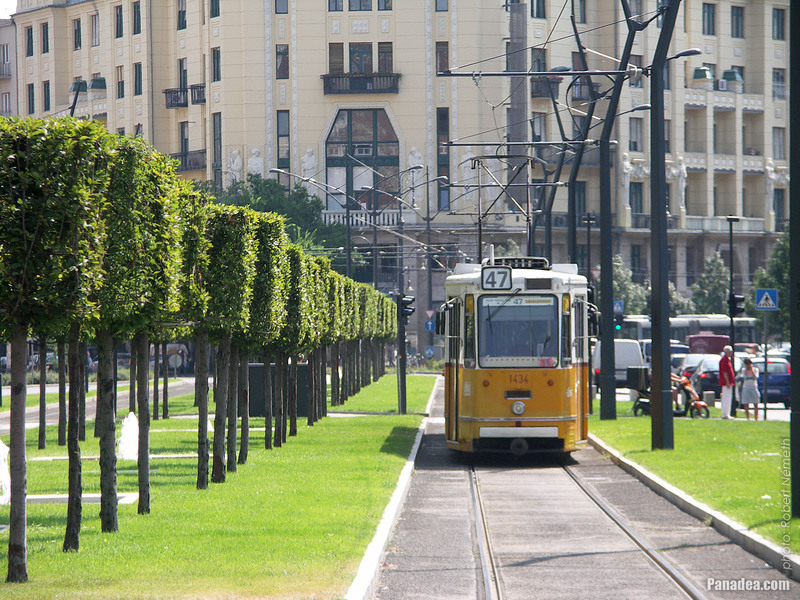 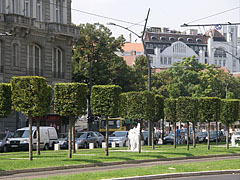 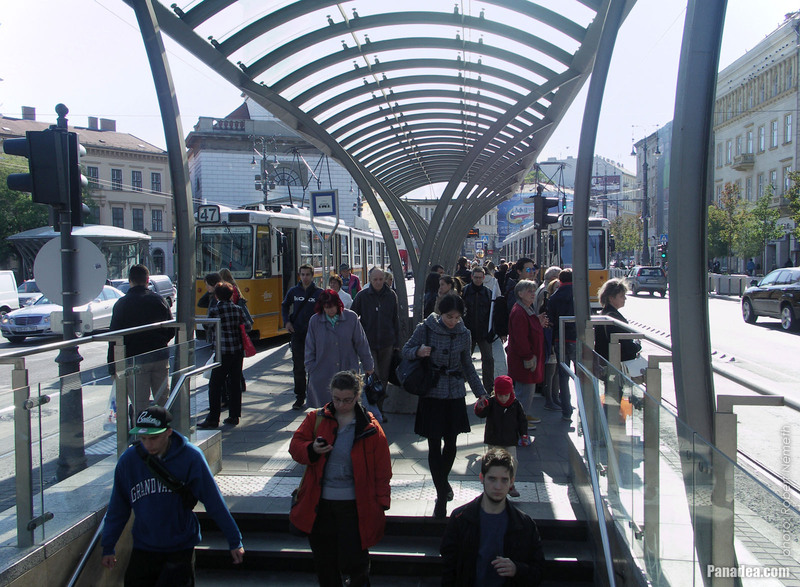 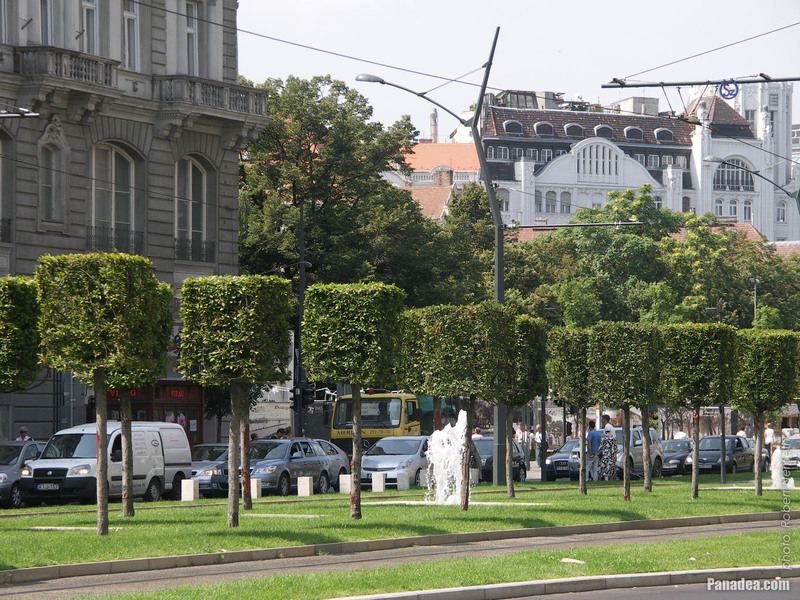 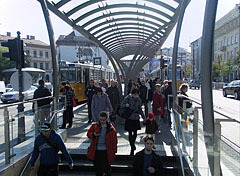 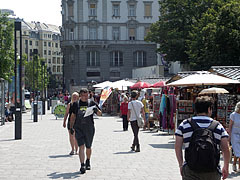 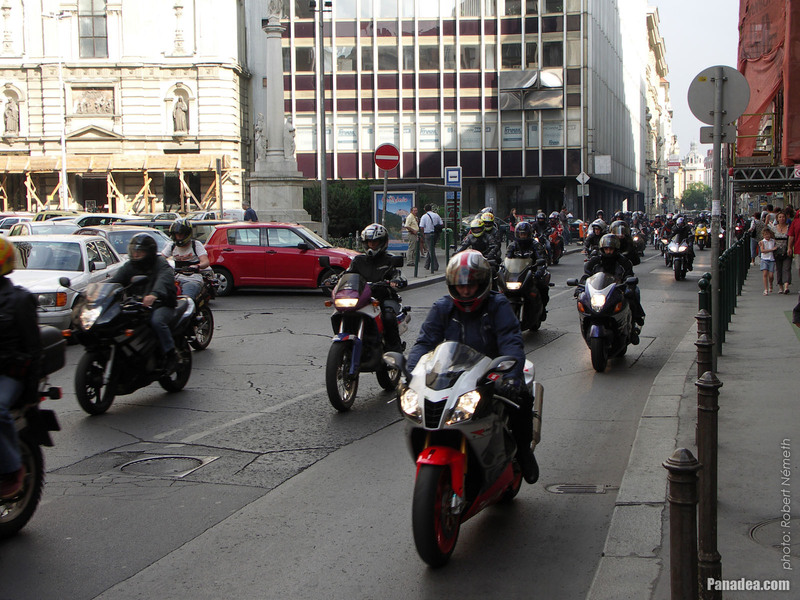 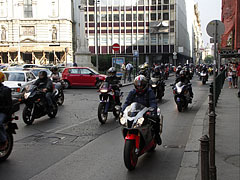 In the background the Gellért Hill can be seen. 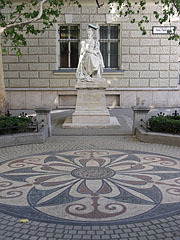 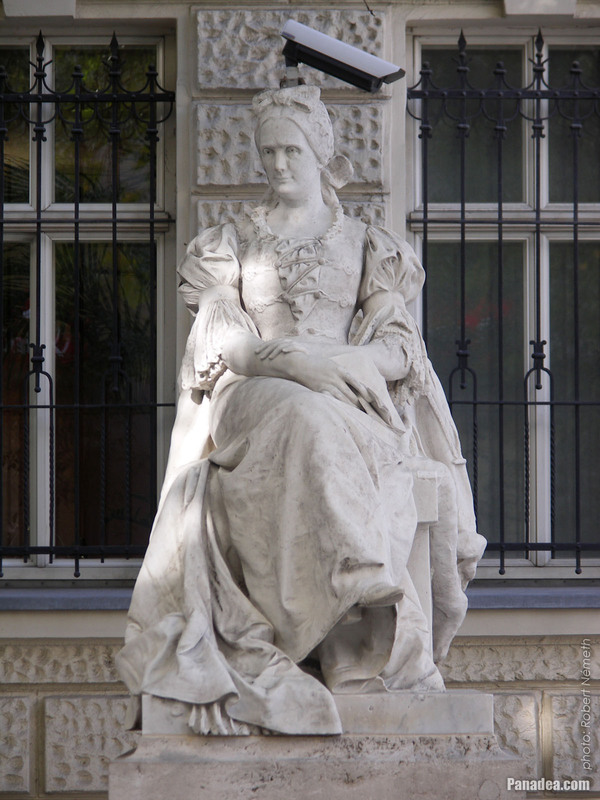 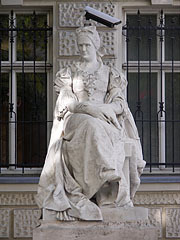 The statue was created by György Kiss in 1906, standing here since the renovation of 2007. 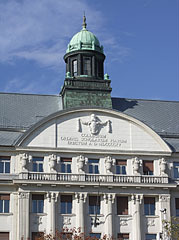 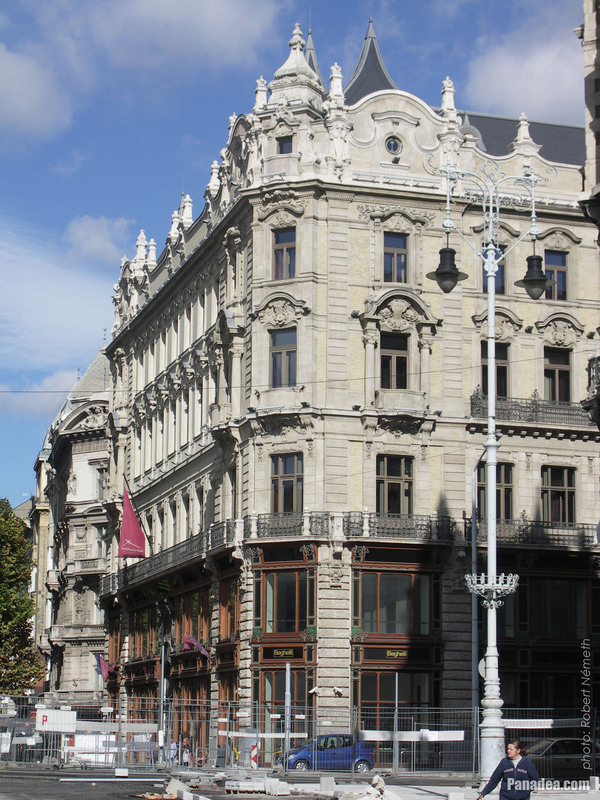 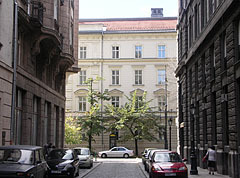 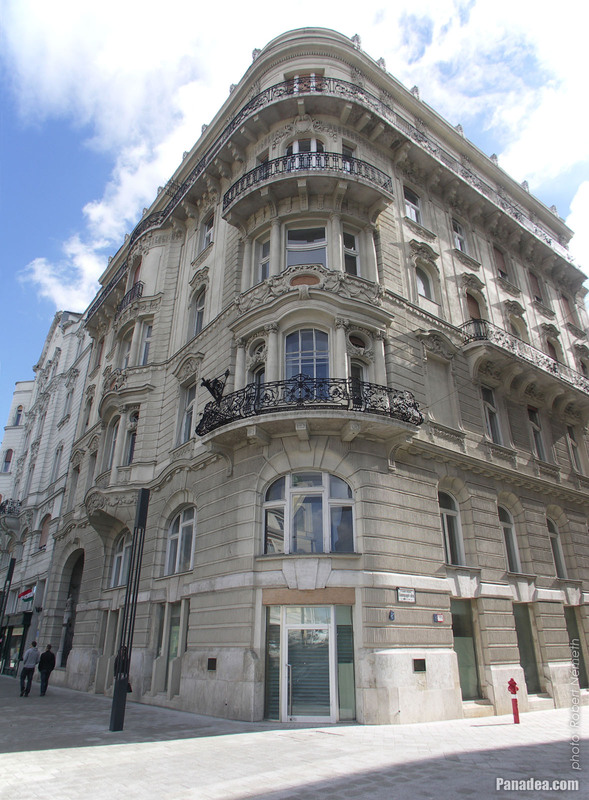 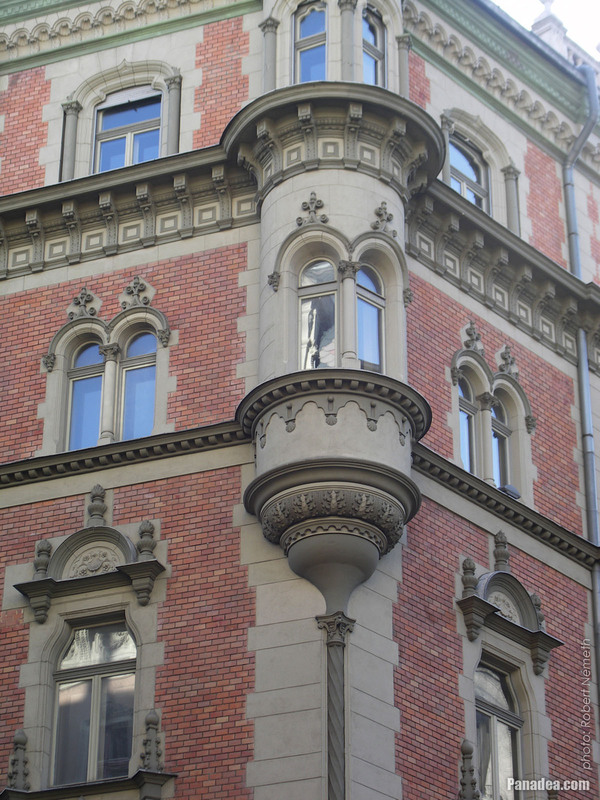 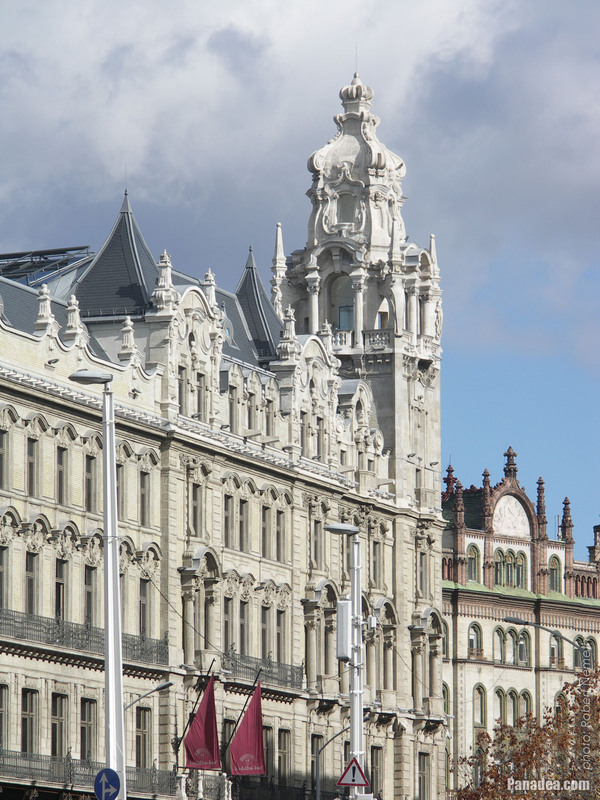 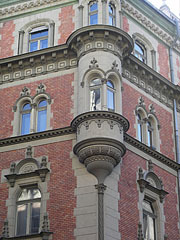 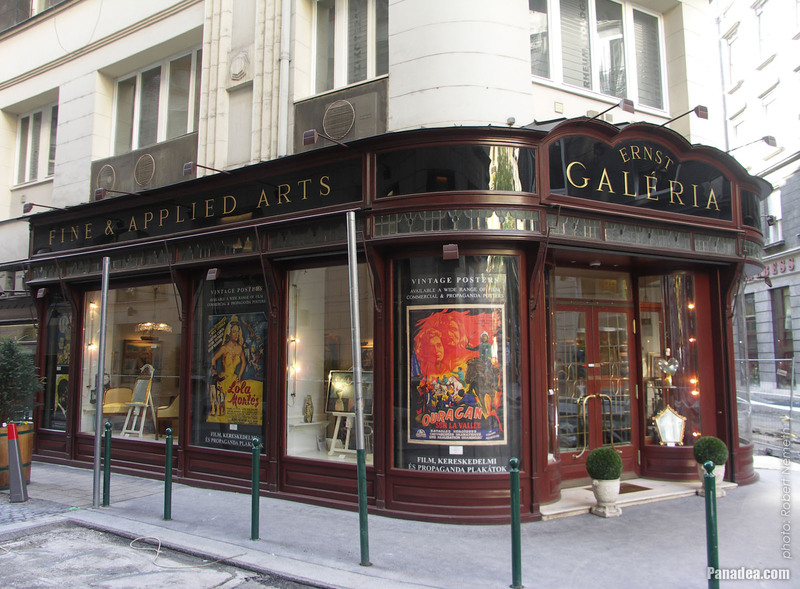 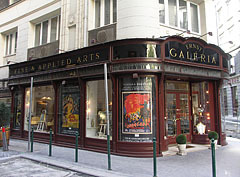 Designed by Flóris Korb and Kálmán Giergl architects, built between 1901-1902. 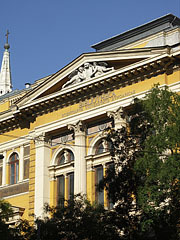 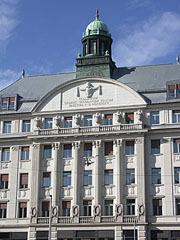 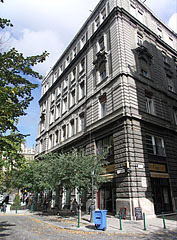 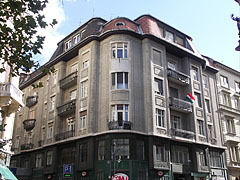 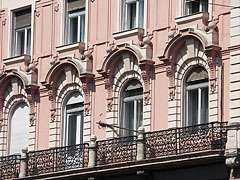 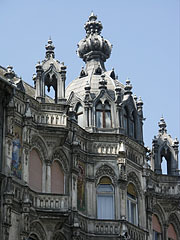 The building was designed by Miklós Román and Ernő Román, built between 1909-1911. 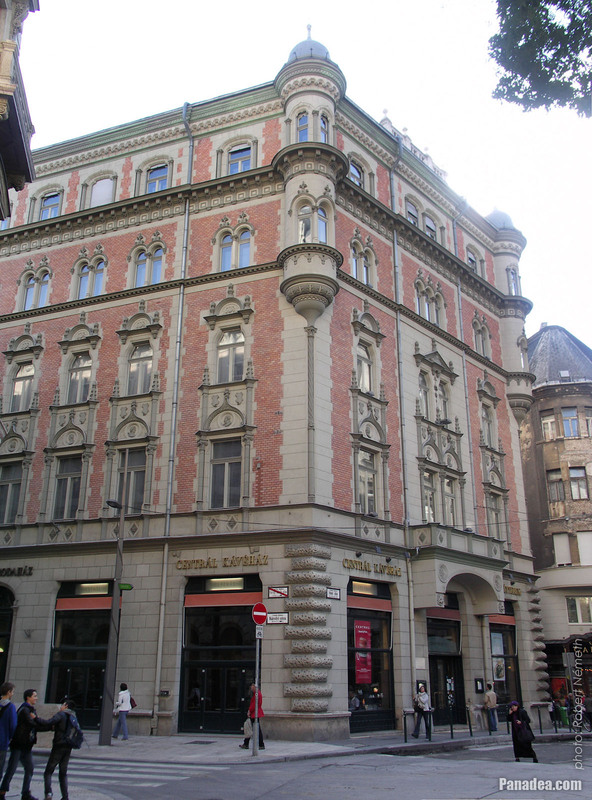 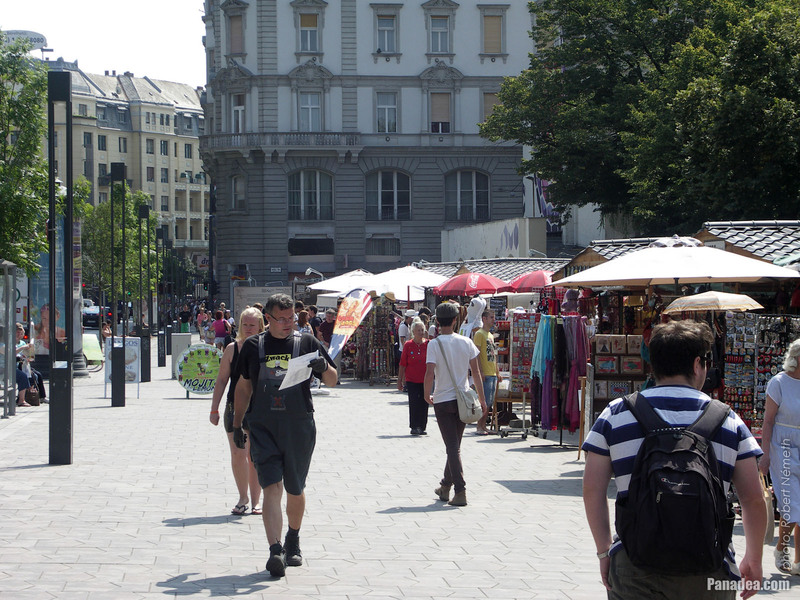 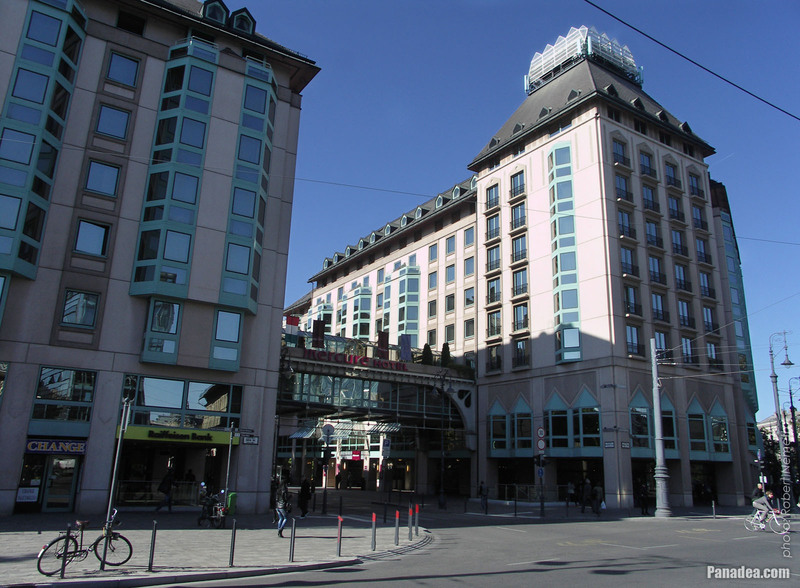 The building was designed by Zsigmond Quittner, it was built in 1887. It was built for Lipót Strasser in around 1909. 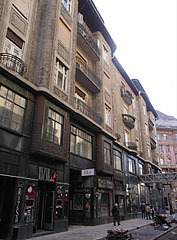 Formerly beside the flats there was a cinema, a tobacco shop and other shops, as well as the Sacher Pensio accommodation within the building. 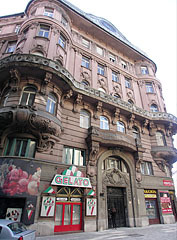 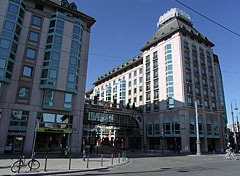 Today among others the "Gelato" Italian ice cream parlor and the Golden Stars ROYAL Apartment accomodation is operated here. 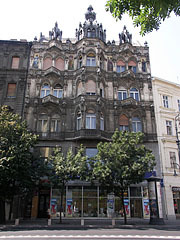 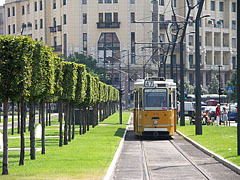 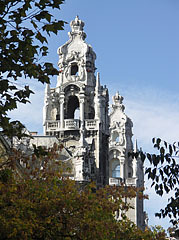 It was designed by Zoltán Bálint and Lajos Jámbor, built in 1910. 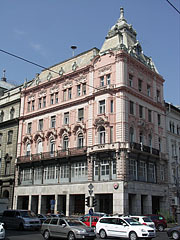 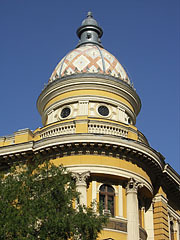 Designed by Ferenc Kasselik, built in 1837. 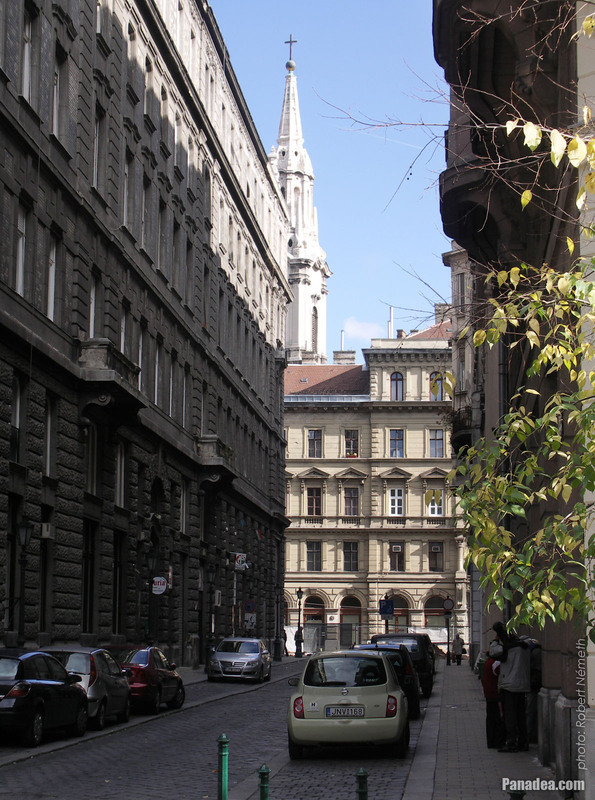 The old city walls of Pest were on the way of the expansion and development of the city, so in 1897 the city center was completely rebuilt or in fact demolished, because most of the old buildings were torn down. 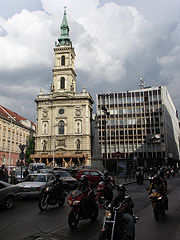 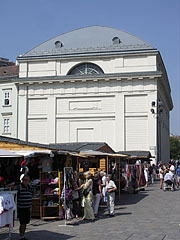 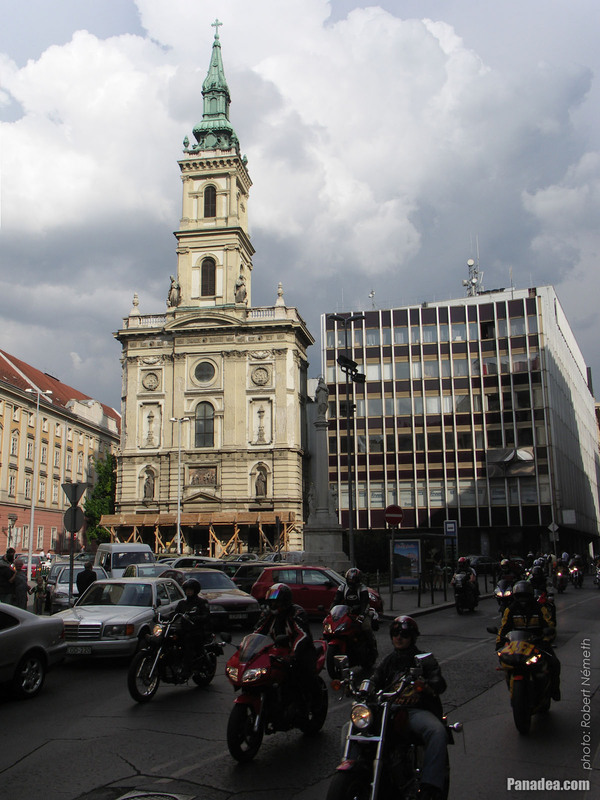 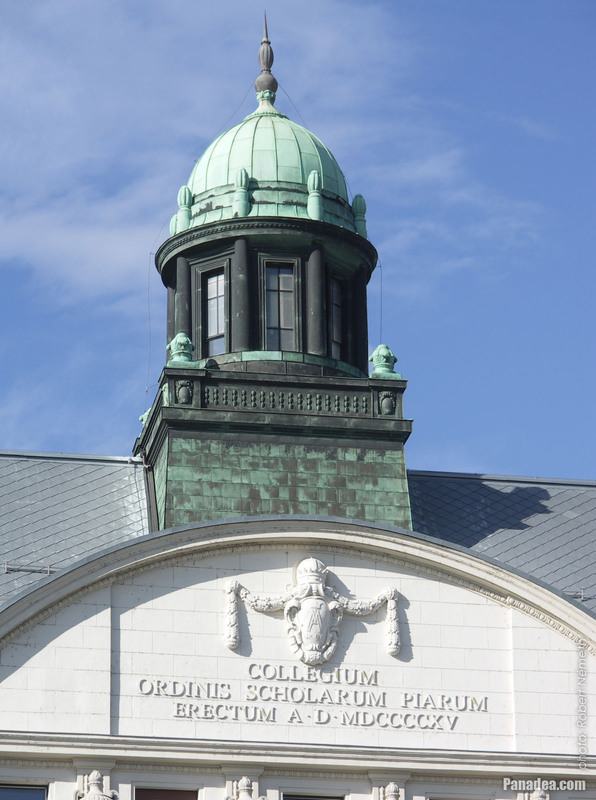 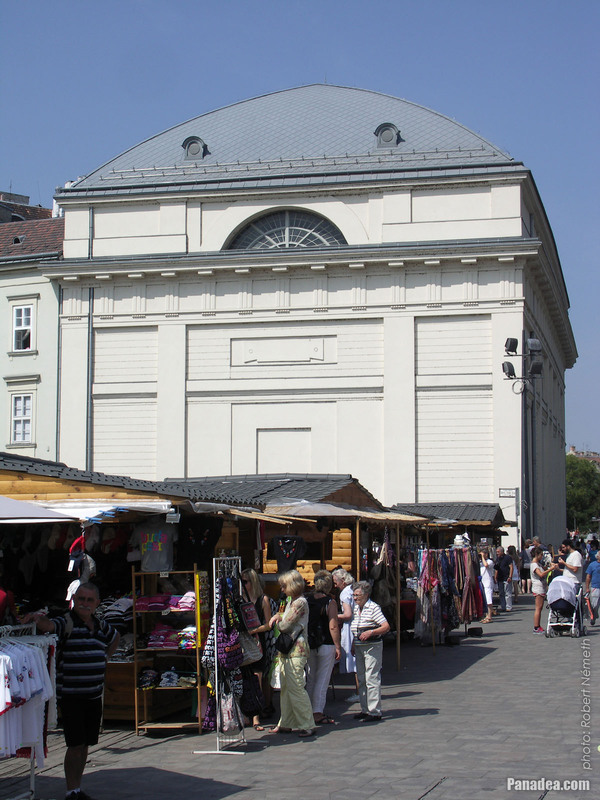 But from the old downtown this neoclassical style building survived the demolition, beside for example the Péterffy Palace and the Inner City Parish Church.